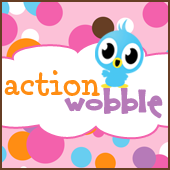 Action Wobbles: Have a Wonderful Day! Hello everyone! Heather here aka Greenscrapinmachine. Today I made a simple card using the Campin' Critters cartridge. I cut the bunny at 3 3/4 in. The paper comes from Recollections, the card is the basic A2 size, the background paper is cut at 5 1/4 x 4 and then I ran it through the distressed stripes Cuttlebug folder. I used some tan jute and added a button from the Spring Collection by Papertrey ink. The sentiment inside the card comes from TheScrapbookingQueen's stamp set The King's Birthday. For the final touch, I placed the bunny on an Action Wobble! Hope you enjoyed this simple card!! Heather - this is so adorable! I love that glitter on the guitar! Beautiful wobble creation! Thanks for sharing your idea! I love to wobble!